“Ballistic and Cruise Missile Threat,” Air Force ISR Agency, accessed July 3, 2014,http://www.afisr.af.mil/shared/media/document/AFD-130710-054.pdf. 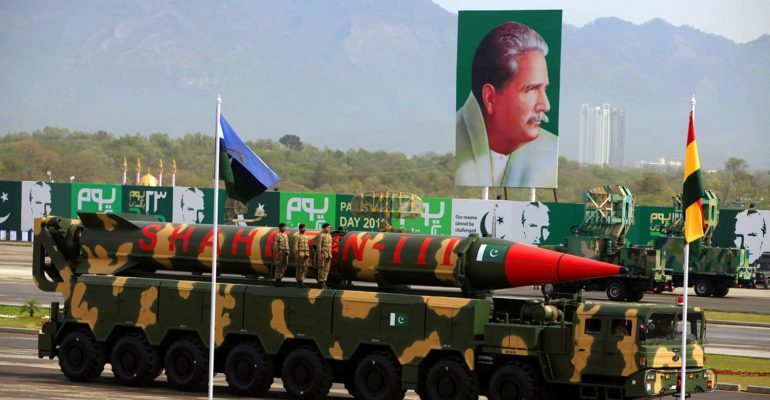 Richard Fisher, “Pakistan’s Long Range Ballistic Missiles: A View from Ideas,” International Assessment and Strategy Center, November 1, 2004, accessed July 8, 2014,http://www.strategycenter.net/research/pubid.47/pub_detail.asp. Hans Kristensen and Robert Norris, “Pakistan’s Nuclear Forces,” Bul, 2011, accessed July 9, 2014,http://bos.sagepub.com/content/67/4/91. “Ghaznavi/shaheen-Ii – Pakistan Missile Special Weapons Delivery System,” Federation of American Scientists, accessed July 9, 2014, http://fas.org/nuke/guide/pakistan/missile/shaheen-2.htm . Hans Kristensen and Robert Norris, “Pakistan’s Nuclear Forces,” Bul, 2011, accessed July 9, 2014,http://bos.sagepub.com/content/67/4/91 . Reshmi Kazi, “Shaheen-Ii Test: Ramifications for India,” Institute of Peace and Conflict Studies, March 18, 2004, accessed July 9, 2014, http://www.ipcs.org/article/defence/shaheen-ii-test-ramifications-for-india-1345.html .